5.9 brings a new attribute $HoverExpression which Tinderbox displays when you hover the mouse over a note in map view. Some common things you might want to display include $Text, $Prototype, $Wordcount, etc. It seems to be great for information that you want to have on hand but don't necessarily want to clutter your map with. 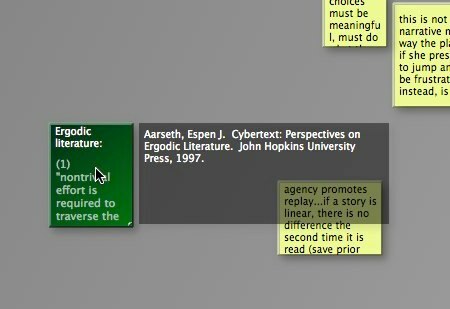 Here's an example of how I used it in a research document to display note citations. I'd love to see how others are using this feature! Cool. What would be the procedure for getting TB to show citations this way? Thanks. As with anything in Tinderbox there are several ways you could do this. You could have a $Citation attribute (which would probably not be too cumbersome with the new autocomplete feature), but my workflow is usually to make prototypes for each of my sources and to set the notes from that source to the appropriate prototype. The name of the prototype is the full citation, so I just have the $HoverExpression display $Prototype. to show the citation followed by the page number. I was mulling over how Hover might work for me, but Stacey's example is perfect. This is going to save me a lot of visual clutter on my maps, where DisplayExpression was using way too many variables. thanks! @Stacey, what a great method for tracking sources! Thank you for that tip, as well as the Hover Expression idea!